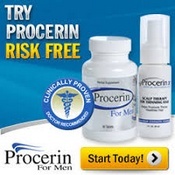 Procerin works to block DHT, one of the most likely causes of male Hair Loss, as well as stimulating new hair growth. There are two components to the Procerin approach: a nutritional supplement taken orally, and a Scalp Therapy Foam that is applied directly to the scalp. It's important to note that because of the way Procerin works, it's most likely to be effective for men ages 18-35, or for older men whose hair is still actively growing. For those whose hair is no longer in a growth phase, Procerin can still be helpful in retaining existing hair. Procerin is offered by Speedwinds Nutrition, an "A+" rated, accredited company with the Better Business Bureau. The business also offers a Hair Loss supplement for women, Sephren; both products are backed by a fantastic 90-day satisfaction guarantee, so it's risk free to try either product. We appreciate that the two components of Procerin, the Hair Regrowth Complex supplement and the Scalp Therapy Foam, can be purchased in an affordable combo pack or separately as needed. Whether you order them separately or together, you'll save more money with larger orders. For example, a 1-month combo pack of the supplement and Scalp Therapy sells for $49.99, while a 6-month supply sells for $219.99. If you like seeing the scientific proof behind a company's claims, we encourage you to check out the Clinical Study page. We appreciate that Procerin was independently researched and shown to be effective in reducing Hair Loss for the majority of its users. Some customers even report improvement in as little as two weeks; however, most men will need to use Procerin for 1-3 months before seeing significant improvements in hair count. Procerin is effective at preventing Hair Loss and promoting regrowth, and the two-step process is affordable and easy to use - all with a risk-free, 100% satisfaction guarantee for the first 90 days of use. For all of these reasons, Procerin earns our top ranking among Hair Loss products for men. Sephren is our top-rated nutritional supplement designed to fight Hair Loss in women. Whether your problem is caused by hormonal changes, illness, or other factors, Sephren is safe to use and can both prevent further Hair Loss while helping to regrow strong, healthy hair. Vitamin B6: an important piece in the puzzle of new cell formation. A B6 deficiency can lead to Hair Loss. Biotin: another B vitamin, this nutrient helps the body produce keratin, one of the components of human hair. Magnesium Oxide: interacts with B6 and potassium and helps with the activation of amino acids, helping the body to more fully utilize vitamins and other nutrients. Horsetail Silica: helps stimulate hair growth and connective tissue. Sephren is easy to take: just two capsules per day. Many women will appreciate not having to apply messy creams and tonics. You can expect to see noticeable results within the first three months of use; the manufacturer recommends continued use after that first 90-day period for best results. One bottle costs $26.95, and you can save by buying more: $69.95 for 3 bottles, and $119.95 for 6 bottles. This is one of the most affordable Hair Loss products currently on the market. Sephren and its corresponding product for men, Procerin, are both distributed by Speedwinds Nutrition. The company has a flawless "A+" rating as an accredited business with the BBB, demonstrating a solid track record for customer satisfaction. Sephren and Procerin both come with an excellent 90-day satisfaction guarantee: if you don't see the improvements in your Hair Loss that you were hoping for, return any unused product to Speedwinds Nutrition and they'll issue a full refund. Sephren is all-natural, affordable, and safe. This nutritional supplement for women's Hair Loss earns our highest rating for handling hair loss in women. ProFollica is billed as "the natural hair loss product for men". Since our last review of the product, there have been some changes. Originally, ProFollica was sold as a Hair Loss product for both men and women. Also, the site now contains much more thorough information about the components of the product, especially the ingredients in each of the two parts of the ProFollica regimen for combatting Hair Loss. We like that prospective customers can see the actual results from the clinical trial: just look for the yellow "Click Here to Read the Study" button towards the middle of the main page. You'll also see several before-and-after photos showing good results from using ProFollica. You have up to 60 days to try ProFollica and determine if it works for you. If you don't see the results you hoped for, you can get a full refund of your purchase price if you return the unused portion within 67 days (i.e. 60 days for the trial period and 7 days for return shipping). ProFollica is sold by Leading Edge Marketing, an accredited, "A+" rated company with the Better Business Bureau. Leading Edge maintains a good reputation for honoring their satisfaction guarantee and doing their best to help their customers. The one thing we don't like about the ProFollica buying experience is the lack of upfront pricing. In order to find out how much it'll cost, you have to enter your name, address, email, and phone number. You'll spend up to $59.95/month for the ProFollica system, and shipping is only free with a 6-month supply; otherwise, expect to pay $12.99 for delivery. We also noticed on the order page that Leading Edge had a different money-back guarantee there: "Please try our product for 90 days (3 tubes)." Given that the copyright on that particular page was 3 years prior to the date of our review, it looks like Leading Edge might have forgotten to change the fine print on that part of their site. To be on the safe side, assume that the 60-day money-back guarantee is what applies to your ProFollica purchase. In general, if you want an effective, natural product for men's Hair Loss - and a good 60-day money-back guarantee from a trustworthy company - ProFollica might be the right product for you. ReGrow Plus is a 100% natural herbal supplement that tackles hair loss by stimulating healthy circulation to the scalp and hair follicles. This supplement is offered by Native Remedies, a trusted company with an "A+" rating at the Better Business Bureau - definitely no "snake oil" trickery here. To use this hair loss product, dilute ½ mL in at least ¼ cup of water and drink, three times per day. Because ReGrow Plus works from the inside out, you won't have to deal with messy topical applications. If you sign up for Native Remedies' email list as a new customer, you'll get a coupon code for a 15% discount on your order. You can also save more with their Buy-2-Get-1-Free offer; many of their products are eligible for this promotional pricing, including ReGrow Plus. An additional eligible product you may want to consider is the ReGrow Scalp Massage Oil: while the supplement can work well on its own, using the massage oil on the scalp may also help prevent hair loss and encourage growth by further increasing blood flow to the scalp and nourishing the hair follicles. A third product in the series, Hair Growth Promote for Folic Health, can be added to the regimen for further reversal of Hair Loss and is administered as an oral spray. We found several reviews that said that after using all three products, noticeable improvement was seen within 60 days. One thing we love about all of Native Remedies' products is their one-year money back guarantee. The company continues to demonstrate their commitment to their customers by making it risk-free to try any of their all-natural products. Given that it can take more than a month or two to see results with their Hair Loss product line, we appreciate that they give their customers ample time to try it out and return it if it doesn't work. While ReGrow Plus doesn't have hundreds of customer testimonials or before-and-after photos, the customers who did write reviews were consistently pleased with the results they achieved when using the product. The smell and taste of all-herbal products may be unappealing to some users, however, which is why we appreciate Native Remedies' refund policy too. ReGrow Plus is a solid option for people who want a completely natural approach to stopping Hair Loss and encouraging the growth of healthy hair. Although the main focus of Advecia - namely, blocking DHT that's produced from testosterone - may seem applicable only to males, this supplement is suitable for men and women alike. Progressive Health has a strong satisfaction guarantee: return any unused portion of your Advecia supplement within 180 days, and you'll get a full refund (minus any shipping costs you paid). The company's reputation is further established by an "A+" rating with the BBB over a history spanning more than 20 years. In fact, it's this solid reputation and refund policy that have kept Advecia from being ranked lower. Why? Looking at the website, you'll see that it's not secure (i.e. no https://), there are no before-and-after photos, and there are very few customer reviews or testimonials. In other words, it's hard to know beforehand if Advecia will be effective for your Hair Loss - but at least you can be confident that if it isn't, you'll be able to get your money back in the first 6 months. In the meanwhile, we hope to see some upgrades to the Progressive Health site before our next review of their Advecia product. Scalp Med offers hair loss products for both men and women. Each formula consists of the same foundational ingredients: NutriSol for pre-application and a Minoxidil-based product known as Vitadil. Minoxidil is the only topical product approved by the FDA for stimulating hair regrowth. To use Scalp Med, you'll start by applying 4-6 pumps of NutriSol [which, strangely, was misspelled on the main "How to Use" page of the website] directly on the affected area, massaging the product in after 2-3 pumps. Using NutriSol is meant to "create an ideal scalp environment" to support new hair growth; the formula includes Retinol, Beta-Sitosterol, Panthenol, and Biotin. Next, the Vitadil solution is applied to the same area, also massaging in after 2 pumps. Because this second step contains Minoxidil, you'll want to wash your hands after applying. This process should be done twice a day. The concentration of Minoxidil is 5% in the Men's formula and 2% in the Women's formula. Since our last review, Scalp Med has made some improvements to their customer satisfaction policies. Their product guarantee has been extended to 60 days, and their price for a two-month supply decreased from over $150 to just under $100. Unfortunately, it'll be challenging for you to know if Scalp Med has been effective for you within that two-month guarantee window - because the manufacturer says that you are likely to see more hair loss at the beginning of the process, as "unhealthy hairs" are shed and thicker, healthier hair fills in. We think that many users would panic, seeing an increase in hair loss, without taking the time to see if the product worked. There are a number of convincing before-and-after photos from real users; you can find those under the Success Stories tab at the top of the page. Be aware that all of those users received the product for free and had to use it for at least six months to produce the results you'll see. And, the makers of Scalp Med say that you should continue to use the product - well, forever - in order to keep your new, full head of hair. Doing the math, you'll pay $50/month for as long as you use it. We recommend that you keep an eye on both the 60-day refund window and your shipping dates; Scalp Med is automatically shipped to you every two months, unless you choose one of the larger delivery packages of 4- or 6-month intervals. If you request a refund or want to stop your shipments, you'll need to be sure to contact the customer service department well in advance. We appreciate the changes that Scalp Med has made, to make their hair loss product more affordable and less risky to try for up to two months, and that they have formulas for both men and women. But, if you've already tried a Minoxidil-based product for your hair loss and not gotten results, you'll need to select a different product in our review. Lipogaine comes in a wide variety of products, all designed to help prevent Hair Loss and stimulate regrowth. You'll find separate formulations for men and women, with an option for people with sensitive scalp and shampoo/conditioner as well. The makers of Lipogaine are somewhat secretive about the ingredients in their main Lipogaine product. Both the men's and women's formulations contain a "Proven Hair Growth Stimulator" - given that it's in a concentration of 5% in the men's product and 2% in the women's, we're guessing that this "proven" ingredient is likely Minoxidil. Other ingredients include saw palmetto, biotin, niacin, and vitamins B6 and B12. The Lipogaine Sensitive products eliminate propylene glycol, which can cause scalp irritation. To apply Lipogaine, use the included dropper to apply approximately 1 mL to the area of the scalp with Hair Loss. This should be done twice a day, with at least 8 hours between applications. According to the manufacturer, it can take up to 10 minutes to dry completely. Lipogaine also makes shampoo and conditioner that helps your hair grow, prevents hair breakage and premature loss, and is suitable for men and women. The Big 3 Shampoo has emu oil to moisturize the scalp, biotin, niacin, and saw palmetto. Alternately, the Big 5 product line has 17 hair-stimulating ingredients, including caffeine, Argan Oil, Castor Oil, Rosemary Oil, and more. We weren't very reassured by only having an online form to contact the makers of Lipogaine. While we think it's great that they offer a 90-day money-back guarantee, we were left wondering how difficult it might be to make that request and actually get a timely response. And, with several places on the site with clearly non-native English grammar mistakes, we would have felt better if we could reach the company more directly. Evidently the Better Business Bureau thought so too: at the time of our most recent review, Lipogaine had no rating because the BBB was "unable to locate business" at its registered address in Massachusetts. The one positive for Lipogaine is that we found reviews of the products on third-party sites: hundreds of people who have used it and had improvements in their Hair Loss. While Lipogaine is priced affordably and seems to be comparable to other Minoxidil-based products, the information provided on the website is vague, especially when it comes to contacting the company to ask questions or request a refund. Most customers will probably have a more reassuring shopping experience by purchasing Hair Loss products from a more established company. Provillus uses the FDA-approved ingredient Minoxidil to fight both male and female Hair Loss. According to the Provillus site, Minoxidil helps with Hair Loss by dilating veins in the scalp and thus increasing blood flow, plus opening potassium channels in the body to allow for better delivery of oxygen and nutrients to hair follicles. You'll need to choose between the men's formula and the women's: the male product comes in a strength of 5% Minoxidil, while the women's has a concentration of 2% Minoxidil. There are no directions shown on the Provillus site, but typically a Minoxidil-based product is applied topically to the target areas of the scalp. Unfortunately, it doesn't look like the makers of Provillus stand behind their product. Even though the site says you have 90 days from the date of purchase to request a refund, you should also expect a $10 restocking fee per item. You have to request an RMA number through a third-party site, Web Support Center, to start the process - and, by the way, they only accept returns on unused products. In other words, if you try Provillus and see no improvement in your Hair Loss, you're out of luck. Plus, the site feels misleading when it asks where to deliver "your free bottle" - you won't find out until you get to the pricing page that the "free bottle" is only included when you buy 2 or 4 at once. The pricing also says in fine print that you'll be placed on an autoship plan; if you don't cancel - or can't reach someone in their customer service department - your next package will come automatically and your credit card will be charged. All of this - the lackluster return policy, the hoops you have to jump through to get a refund or to even reach a customer service representative - are probably why Provillus had an "F" with the Better Business Bureau at the time of this most recent review. On the BBB site alone, there were 5 unanswered complaints: not exactly what you want to see from a business. With many other Minoxidil-based products on the market, there's no reason to take a risk on Provillus. We recommend that you choose another Hair Loss product in our review. As the most commonly-used prescription product for male hair loss, Propecia might be the first option that comes to mind when considering a hair loss product. Manufactured by the pharmaceutical giant Merck, Propecia is available in its generic form, finasteride, only when prescribed as a substitute for the brand name Proscar: a higher dosage primarily used for benign prostatic hyperplasia (also known as enlarged prostate). The good news is that Propecia is effective to fight male pattern hair loss. More than half of the men who use it have seen significant improvement in the thickness of their hair and reduction of their bald spots when taking the tablets for at least three months. However, there are serious drawbacks to using Propecia for hair loss. The first one is the most obvious: it not only is ineffective for women, but it also can be extremely harmful to those who are pregnant: Merck says that they shouldn't come in contact with Propecia tablets and should call their physician immediately if they do. Why? Propecia can be absorbed through the skin, which can lead to birth defects if the unborn baby is male - because Propecia works by blocking male hormones. What about side effects for men? Every prescription medication has a list of side effects; Propecia's include liver problems, an increased risk of prostate cancer, changes to male breast tissue, and complications with sexual function. Finally, Propecia is expensive: a one-month supply usually costs approximately $75 and is often not covered by insurance. That might not sound too hefty - until you consider that once the medication is stopped, hair loss resumes. So, you'd need to plan on spending $75 per month indefinitely, in order to maintain any hair regrowth and prevent future hair loss. For all of these reasons, Propecia is our lowest-ranked product for hair loss. It is completely unsuitable for female hair loss, and the side effects when used for male hair loss are sobering at best. With so many over-the-counter hair loss products available - with equal or better effectiveness, fewer side effects, and lower costs - we think you'll have no problem finding an alternative to this prescription medication.